Positively Miscellaneous: David Bowie's "The Next Day." On the afternoon of March 6th, I got a phone call from an acquaintance of mine. 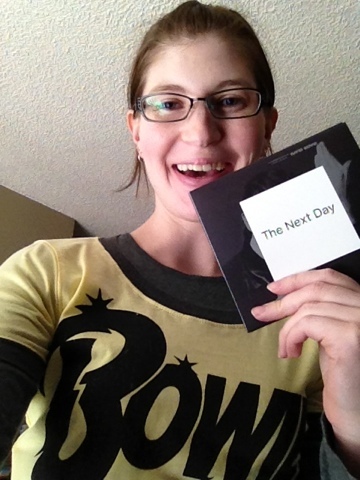 In it, Ryan (fellow David Bowie fan) told me that the CD store nearby only had one copy of "The Next Day" left. I quickly made my way over and got the last copy that had the bonus tracks on it! Yay! Me and my new David Bowie paraphernalia! I also picked up this snazzy new DB shirt from Target which my sister told me about via text the night before. Awesome shirt! Because I needed more... I only have enough to wear a different one everyday for about two or three weeks straight... Moving on. Despite having gotten the CD before it was even technically out, it took me a few days to listen and process. As a DB fan, I am already inclined to like it. And I did. But, sadly, it wasn't my favorite. I think with time it will begin to grow on me. The song and music themes are more dark or sad, reminiscent of "Earthling," I'd say. I don't have all of David Bowie's CDs (yet because have you seen how many he's done??? ), but "Earthling" has been my least favorite so far. I started out with a lot of excitement leading to some mild disappointment mixed with intrigue. When the first song, "The Next Day," came on, though, all I could think was, "He's still got it!" I love listening to that voice. Which brings me to one of the things I dislike about the album aside (and which I disliked about "Earthling"): I don't like it when they do funny things to alter DB's singing voice. I don't like using all of that technology to make his voice sound strange and demented. He has such a unique, wonderful voice. I can't imagine wanting to change the sound and cadence. Can I call myself a purist? The second and third time through, I liked it more and more. The only song that I just do not like (which means I will skip it on my iPod a lot) is "How Does the Grass Grow?" I tried, I thought reading the lyrics would help (and it did, a little), but I am just not crazy about it. Not because of his voice, just because it's dark. Though not necessarily darker than the rest of the album. "The Next Day" was also dark, but I liked it better for whatever reason. I still like "The Stars (Are Out Tonight)" and "Where Are We Now?" is my favorite. I enjoyed "(You Will) Set the World on Fire" and the one love song, "So She." Overall, a little dark for my tastes. However, once it gets all mixed in with the rest of my DB music (giving me 200 DB songs!) I'm sure it will be fine.